DESCRIPTION John Haddon Designed Custom home built for its current owners. This exceptionally well built home offers 3170 sq ft of total living space + is situated in a great location in the heart of Marda Loop on a gorgeous large treed + landscaped lot (50 by 125).Lovely curb appeal with brick exterior + a spacious veranda to enjoy the south sun. Large entrance, living room with lots of light, beautiful millwork, gas fireplace with granite surround + direct access to the very large dual decks. The dining room is semi formal + is complete with built in hutch. Expansive kitchen with gorgeous cream coloured cabinets, professional appliances including induction 5 burner cooktop, double wall ovens, oversized Kitchen Aid refrigerator.Very charming corner banquette with large table + views to the street. Upstairs there are 3 big bedrooms, all with vaulted ceilings. The master suite is substantial in size + includes a sitting area, walk in closet + ensuite bath with standalone shower, bubble jetted tub + heated flooring.The lower level has direct access to outside with a large patio door off the family room. There is also a full bath, office + large laundry room with lots of cupboards, counter space + storage. Huge landscaped backyard with oversized double detached garage.The garage has a second level storage space + workshop (not built at the time of the new home).Quality materials used throughout including lots of millwork + built ins, hardwood flooring, cabinetry, European tilt + turn windows, + more. Very low heating costs. Fully smart-wired (Audio/ Visual/ Lighting/ Security)by Home Tech Solutions. Audio includes 14 inside + 2 outside (upper deck +patio). 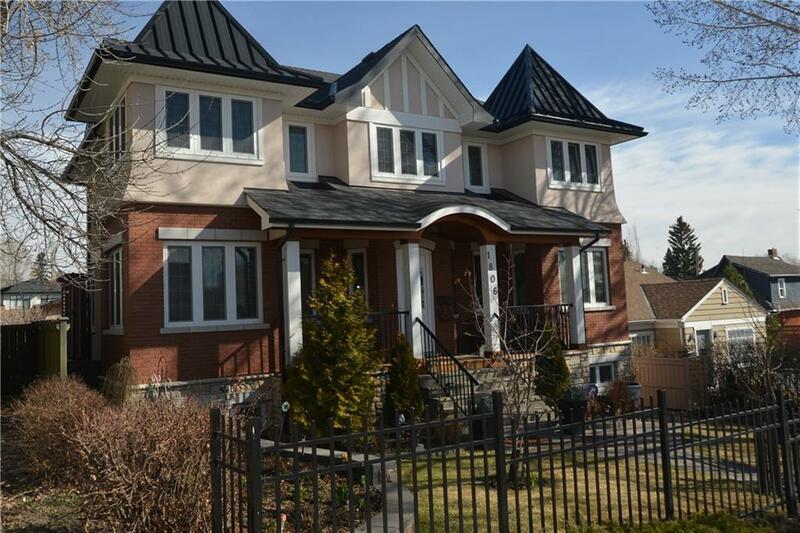 Terrific location close to schools, the library, shopping, restaurants + downtown.